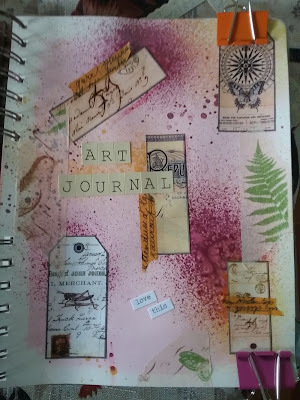 Sunday's art journal page is a 2 page spread of sunny yellow distress ink and golden smoochies spray. A wheat field stamp and umber Stazon ink add visual interest in the bottom corners of both pages. A misplaced stamp presented a good space for some journaling about the events of the day. I used a white uniball pen for the journaling. I printed them on cream colored cardstock, cut them out, distressed the edges and inked them with Tim Holtz distress ink. I used the same distressing process on these "postcards". I added some elements from BoBunny, C'est La Vie Collection; flag stickers, a cute yellow "happy" brad, and a "Just Be" rub on. I sketched around the flags with black pen to help them pop off the page.